I peered out the motel window when I woke to see it raining lightly. Curses. However, by the time I left at 7:15am it had stopped but was still threatening. I started walking out of town along the Tooma Road, optimistic that some early morning traveller would pick me up. An hour later, five kilometres out of town and still on foot, I gave up and crossed to walk against the traffic and resigned myself to a long day on foot. I wanted to reach Munderoo Campsite where I had secreted a food drum with enough supplies to see me through to Albury and the end of the trip. It was already going to be a long day, without the unplanned nine kilometre warm-up. I'll admit I could have tried to pressure someone, such as the motel owner, to give me a lift, but I prefer to be independent.....and suffer the consequences. 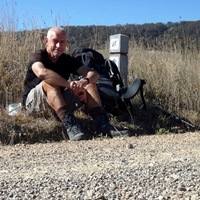 I finally reached the Hume & Hovell Track at Henry Angel Trackhead, the point where I had left the trail on Saturday, at 9am and stopped for a 10 minute break before "starting" my day's hiking. It was raining very lightly, but not really enough to get me wet. The trail picked up where it had left off, following Burra Creek downstream through open pasture and various goldmining sites dating back to 1876. The miners had done quite a lot of work to drain what was a swamp and increase the flow rate of Burra Creek for sluicing by straightening it through blasting channels and tunnels through rock. Very impressive work and still lots of evidence by the trail. After an hour, I dropped my pack at a trail intersection and quickly climbed up a side trail to Big Hill Lookout on the side of the hill from which Hume & Hovell had first seen the Australian Alps. Sadly for me, the day wasn't so clear with lots of low-hanging cloud obscuring the distant mountains, but the nearer views were clear and spectacular. It was worth the detour. I walked back to my pack and then the trail left the farmland behind and descended through forest to a shaky suspension bridge across Tumbarumba Creek. Then began a long and steady climb into Bogandyera Nature Reserve that certainly slowed my pace, but wasn't too tough. Finally the trail reached and followed a ridge which gave glimpses through the trees into the Tumbarumba valley below. It was pleasant forest walking for an hour or so before a steady descent through the forest and into the next rural valley and Mannus Lake. The latter seemed to be a bit of a misnomer as it wasn't much more than a large stream, but I could see the area which would be covered by water in better seasons. The trail followed Mannus Creek through pretty pasture land offering some nice rural views. However, the peaceful scene was somewhat disturbed by irregular air-gun shots from a distant orchard, presumably designed to scare off predatory birds. The trail then followed a road bordering a pine plantation as it headed north and my feet began reminding me that they had gone far enough for one day. I had done about 31km, with about 14km to go, and it was past the time I would normally have stopped on this trip. I tried to remember other days on other hikes when I had ended up doing big kilometres and that helped a bit as I tried to mentally string together milestones on those hikes and other details. Some of those days were definitely tougher than today. I had a break at Mannus Campsite adjacent to a road that would have taken me back to Tumbarumba, then set off for my last 12km. After crossing the road the trail went through a pine plantation and then back to pasture land where huge mobs of kangaroos were grazing. Then began a long steady climb into Mundaroo State Forest, mainly pine plantation, as the sun began setting to my right. For a while the sky was clear and brilliant stars and a half moon emerged to offer some light. I had my last break at 5:30pm and donned my headlamp as it soon became too dark to tread carefully, though there was enough light to see the forest and farmland I passed. The last kilometre or two was steeply downhill on a slippery fire-trail and was quite slow. I was well and truly ready for Munderoo Campsite when I arrived at 7pm and 15 minutes later I had retrieved my food drum and began getting organised to camp and reorganise supplies for the next six days. My feet were very tired and I felt like I could have crawled straight into my sleeping bag once the tent was set up, but knew I hadn't eaten or drunk much during the day and forced myself to eat a meal and update my diary before heading for bed about 10:45pm.